Our new Napoleonic campaign begins soon with each player "inventing" a new German duchy or kingdom. As part of this project, each player has to grab a 25mm mounted general and paint it up as themselves on the tabletop. The leader and commander of their nation. 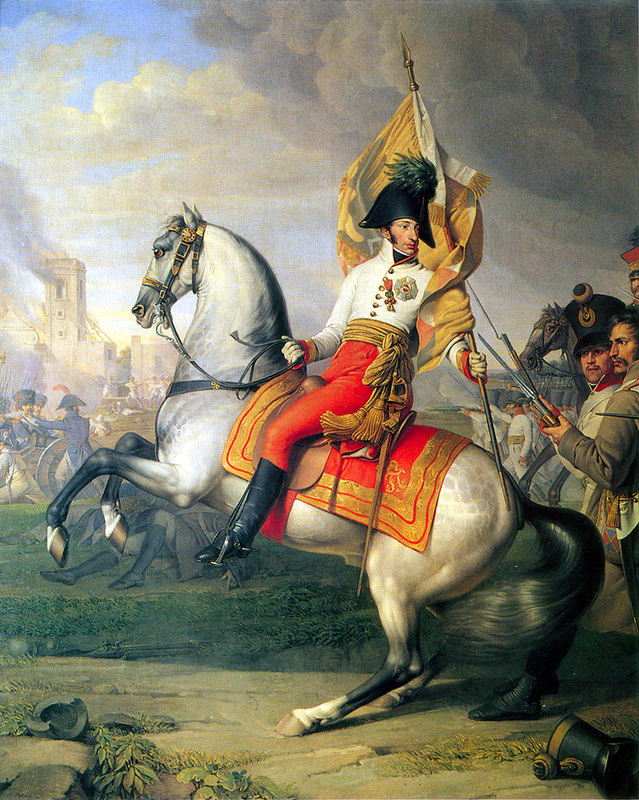 After scouring the web for images of mounted Napoleonic commanders, I decided upon something Austrian or Russian but then found this image of Archduke Charles of Austria. And here is the result. Don't look into his eyes as he will most certainly possess you. Very nice! What make is he? We played an imagi-nation Napoleonic campaign last year that was full of diplomatic and battlefield skullduggery which my partner and I came out on top of by the end. Lots of fun! Thanks for the comments. I am quite happy with him. 25mm is not really my thing and I have rarely painted anything bigger than 10mm. I am not sure what make he is but I will find out. He is a Front Rank figure on a Wargames Foundry horse. - since you are creating imaginary countries, why not unleashing your creativity and design original uniforms for them? - on this blog dealing with many different topics, *labels* would make browsing your archives far easier / more reader-friendly. Labels can be added a posteriori with the 'Edit Posts' utility, and are not a chore if added when posted, or as long as only a few posts (e.g. for your new 'fictional' Napoleonic campaign') are to be back-labelled. Looking forward to discover more: cheers! Sorry WDD: I was misled by the fact that labels appear as a listing, but not after each individual post. Added a link on my blog. Nice work - Welcome to God's Own Scale! Added a few (totally unsolicited!) comments on the relevant TMP thread.